This week we're diving into the Underdark. I swear it's not a double entendre. 31) A Drow cleric takes over a kingdom and she attempts to create a new matriarchal society on the surface. 32) A Drow slave seeks refuge but some are suspicious of his actions. 33) The King needs an antidote for his illness but it can only be made from the fungi found in the Underdark. 34) A Beholder Hive Mother has gathered enough of its kin to take over a Drow city. The Drow reluctantly seek help to take their city back. 35) The group confronts an Illithid (Mind Flayer) only to find it has the same mannerisms as an old friend of theirs. 37) An Aboleth and its offspring have escaped into the Astral Sea as they attempt to make it their own. 38) The Duergar have nearly finished constructing a massive dungeon but for what purpose? 39) A small Drow city has started an uprising by overthrowing their matriarchal society. 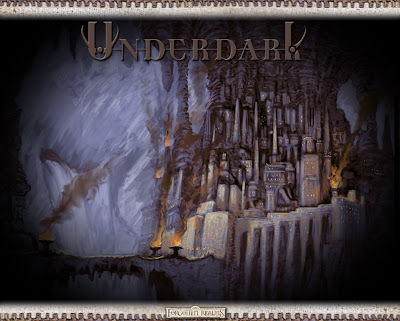 40) The group nearly dies of starvation in the deep catacombs of the Underdark only to be taken in by the Svirfneblin. This is Kylak signing out and hoping you don't get lost in the Underdark. Seriously, it's not a double entendre.